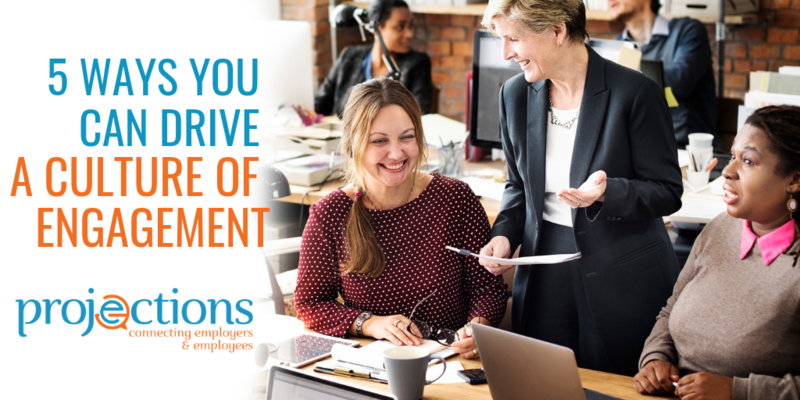 With employee perspectives on ethics shaped by very different sets of life experiences, it has never been more important for employers to engage employees across the generations. Baby boomer and millennial employees can understand common goals, even the company’s mission and vision, but understanding ethics can be an entirely different challenge. Understanding ethics means making decisions on a daily basis with integrity, based on a values-driven workplace culture instead of just a compliant one. The reality is that “Corporate Compliance” is often just a matter of checking boxes. Ethics can be a much more nebulous topic, and much more difficult for Human Resources teams to keep watch over. In an effort to succeed, employees feeling pressured sometimes strive to succeed in the wrong way. Consider the constant stream of news reports announcing ethical violations of theft and deception – sometimes starting at the very top. The reports only scratch the surface of what’s going on. There are employees behaving in ways that are unethical, but the behaviors don’t rise to the level of a crime – backstabbing coworkers, job hopping despite commitments made at the time of hiring, secretly talking to disruptive union representatives rather than approaching supervisors, and on and on the list goes. Ethics is a pervasive principle. 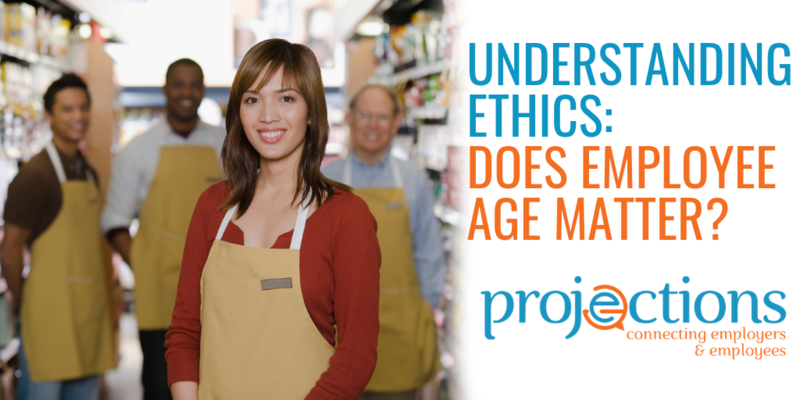 Do baby boomers and millennials have different perspectives on ethics? Multiple surveys suggest they do. Baby boomers operate best in a workplace where there are formal systems to incentivize ethical conduct, access to formal channels that can provide regular guidance, published standards of conduct for responding to questionable activities and ethical leadership. Millennials don’t like boundaries, largely due to technology and globalization. They like the flexibility to handle situations, collaborative work and quick access to resources when advice is needed. They’re more open and transparent, thus more likely to discuss their employer and workplace conditions with a wide range of people inside and outside the organization, creating a setup for ethical violations. Since they’re more flexible, millennials tend to tolerate historically typical unethical or non-compliant co-worker behaviors more than baby boomers, like theft. One reason they don’t report observed misconduct at times is because they have seen “whistleblowers” get punished for doing the right thing. Yet, millennials are more likely than baby boomers to access the person or office responsible for compliance and ethics. The lesson to learn is that they’re very social, so communication about ethics and compliance should include social interaction and ongoing support, like ongoing training, technology-based reporting systems and frequent communications from leaders addressing ethics, which could be social media postings, tweets, HR feedback systems and all the other tools that people use to stay in touch. Over the years, what is considered unethical behaviors has changed. Baby boomers that did report violations focused on things like fraud and financial manipulation. Millennials are more focused on workplace behaviors like sexual harassment, discrimination, biased talent systems, and corporate social or environmental irresponsibility. People were shocked when Google employees resigned to protest the company’s participation in Pentagon-funded projects. When employees question the ethics of their employers, engagement is negatively impacted. A couple of surveys also found that millennials are more inclined to do some things you, as an employer, likely believe are unethical. They include tweeting or posting information online about the organization and keeping copies of confidential documents. These are the types of activities that can easily end up involving unions. With the more relaxed millennial perspective of ethics, the challenge for employers is developing an organizational culture that gives people the freedom to be different, while embracing generational diversity. Gallup’s research indicates that 70 percent of differences in employee engagement come down to local teams. This particular research addressed employees working in a variety of locations, but there is a lesson for all employers. All organizational leaders down to the lowest level must be ambassadors for ethics, driving the creation of an engaging culture that has ethics as a core value. Senior managers ordering people to act ethically via a policy may work with some baby boomers who are used to hierarchal orders, but it won’t be enough for millennials and it won’t create the ethical culture. Ethics must be “glocal” – local and global – whether talking about a particular department or an international business location. 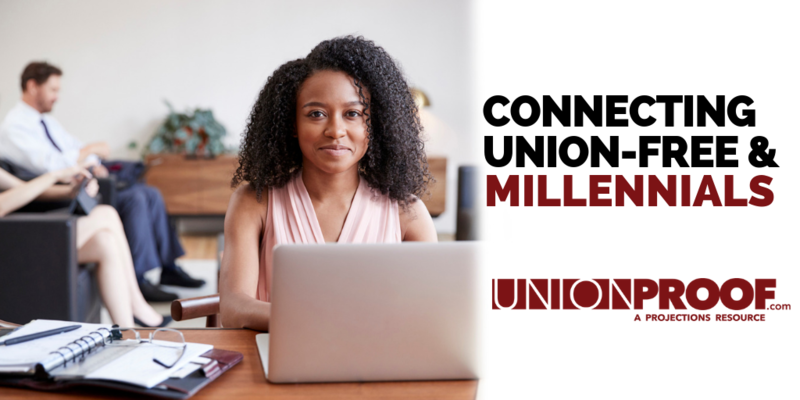 Here’s the caveat: Millennials must have access to the right communication tools, like confidential online helplines before they are likely to report ethics violations. Employees in various generations reported bribery, kickbacks, and stealing, the kind of behaviors baby boomers have traditionally reported. However, other unethical behaviors reported by the 69 percent include misuse of confidential information, sexual harassment, and offering products and services that did not meet quality standards. Ethics goes far beyond compliance. Of most importance is the fact the Ethics & Compliance Institute’s survey found that companies aren’t making progress in developing an ethical culture, which is the biggest factor influencing employee behavior. Only 20 percent of employees surveyed said their company has a strong ethical culture and approximately 40 percent indicated the organization’s ethical culture is weak. Developing a culture of ethics and compliance is crucial to maintaining an organization with a workforce that acts with integrity on a day-today basis. A culture of integrity has certain characteristics, like a set of clear values, senior managers who behave ethically and regularly encourage employees to do so, and consistency of messaging. Your frontline managers should be engaged in reinforcing the culture on a daily basis. People at all levels of the organization should be held accountable for behaving ethically. Internal violations and other employee matters should be handled equitably, a key principle for keeping unions out of the workplace. The organization needs to provide a variety of communication systems to appeal to multiple generations and provide consistent messaging. An effective communication system can send the message across generations in the format each generation prefers and by the people (i.e. CEO, supervisors, co-workers) each generation is most likely to pay attention to, i.e. CEO, middle managers, frontline supervisors and/or co-workers. 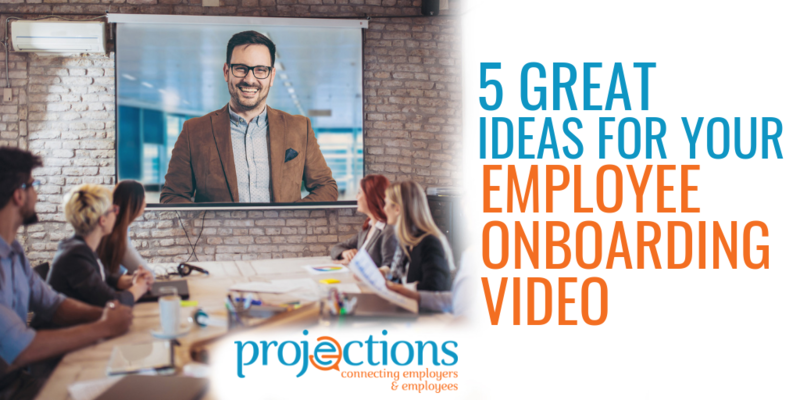 That might be a video played in a meeting or the same video distributed via social media or shared via an email link. Younger generations learn best by doing as they’ve grown up with tablets and smartphones in their hands. For younger leaders, interactive eLearning may be the best training solution. Baby Boomers are often fact-finders and may appreciate having all the Company’s ethics reference information on an easily readable website. Creating an ethical and compliant culture brings a lot of advantages, like a more engaged workforce. It’s also the foundation of creating a UnionProof culture because an ethical culture is supportive of employees, believes in equitable treatment, and is supported by strong and regular two-way communication between employees and managers. People in every generation want to be treated fairly. Think about this: Baby boomers joined unions decades ago because they perceived their employers to be unethical, profit driven rather than people driven, unjust and non-communicative about Human Resources matters, i.e. promotion systems, pay scales, etc. Today, if all team members know their supervisor, and ultimately their employer, will stand behind them when they make tough, ethical decisions, it minimizes the odds of unions taking hold in your business. It’s the best way to stay union free. The following is a guest post from Ronald Adler, President-CEO, Laurdan Associates, Inc.
3) uses sophisticated auditing products and consulting services. Increasingly HR audits are conducted of HR rather than by HR. This paper reviews the change in HR audits, discusses the external and internal forces affecting the process and use of HR audits, and provides information about the leading HR auditing process. organization’s human capital adds value. Under this definition, HR audits are more than an audit activity that solely collects and presents evidence of compliance. HR audits are increasingly expected to look behind and beyond the organization’s assertions of sound and proper HR management practices and to assess the assumptions being made, to benchmark the organization’s processes and practices, and to provide the necessary consultative services that help the organization achieve its business goals and objectives. Numerous external forces and factors have had an impact on the demand for and scope of HR audits. First, in the global economy, human capital is becoming the single most important determinant of competitiveness, productivity, sustainability, and profitability. Increasingly, the organization’s human capital is being recognized as the source of innovation and a driver of business success. Thus, to be effective in the global economy, HR audits must be diagnostic, predictive, and action oriented. 1) Sarbanes-Oxley requires effective internal controls. While Sarbanes-Oxley specifically requires effective internal financial controls, the financial and organizational costs of employment related claims and litigation can have a material effect on an organization’s bottom line, can have a negative impact on earnings per share and the organization’s valuation, and because employment litigation can negatively affect the organization’s employment brand, can impact the organization’s long-term sustainability. “…exercise reasonable management oversight.” If human capital is one of the organization’s most important assets ─ it is certainly one of the organization’s largest expenses ─ is it not reasonable to expect that management applies the same level of oversight and due diligence to the management of the organization’s human capital as it does to the management of the organization’s other assets. 3) The U.S. Federal Sentencing Guidelines require that management demonstrate that it took reasonable steps to engender an organizational culture of compliance and to “monitor and audit” compliance activities, behaviors, and results. Ethical conduct and legal compliance, including nondiscriminatory employment practices, are achieved by management setting “the tone at the top.” Audits ─ including HR audits ─ provide the C-suite and boards of directors with important feedback about how effectively they are communicating this message. 4) Governmental agencies are attacking systemic noncompliance. The EEOC strongly encourages employers to conduct comprehensive HR audits as a tool to ensure that systemic discrimination does not exist. The OFCCP considers self-assessments a “best practice” and has issued its final voluntary guidelines for self-evaluation of compensation practices. The U.S. DOL considers wage and hour self-audits as a valuable tool in ensuring compliance, and the Department of Homeland Security (DHS) and immigration attorneys encourage employers to self-audit their I-9s and hiring processes and practices to ensure compliance with U.S. immigration laws. 5) Venture capitalists, investors, and stockholders are scrutinizing organizations’ human resource management practices, processes, and outcomes and using HR audits to help them properly valuate an organization’s human capital asset, expose liabilities, and perform due diligence. 6) Recognizing the importance of the organization’s human capital asset and the risks associated with misaligned, mismanaged, and unlawful employment practices, internal auditors and risk managers are assuming a leadership role in developing HR auditing standards and in designing and conducting HR audits. While an organization’s size, industry, financial health, commitment to becoming a “best place to work,” and business objectives and imperatives affect the scope and urgency of the HR audit process, we have noted some common features, attributes, and objectives in HR audits recently conducted. with the organization’s business objectives. achievement of EEO and diversity goals, and to benchmark best practices. D. Ensuring due diligence, including: uncovering hidden liabilities and assets, identifying vulnerabilities to be corrected, and identifying opportunities to be attacked. sustainable element of the organization’s internal controls. F. Assessing and managing employment related fraud. sustainable element of the organization’s risk management program. 2) HR audit reports are increasingly being used to report audit findings to wider audience. The distribution of the report on HR auditing findings is no longer limited to senior management. As noted above, an increasing number of third parties are expressing interest in the organization’s human resources management. 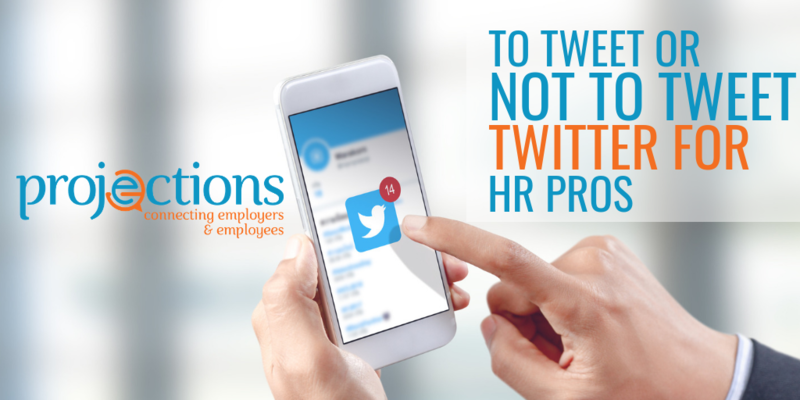 impressions created by their HR audit reports. 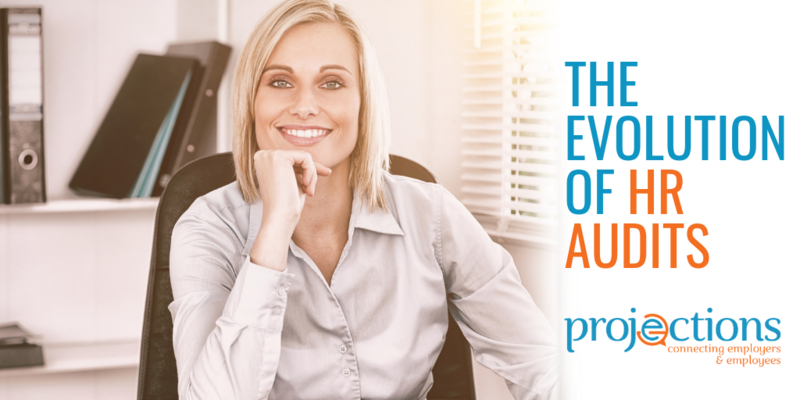 Recognized as setting the standard in HR auditing, the new edition of the ELLA®, the Employment-Labor Law Audit™, the leading HR auditing tool, incorporates the five critical components of an HR audit into the HR audit process. 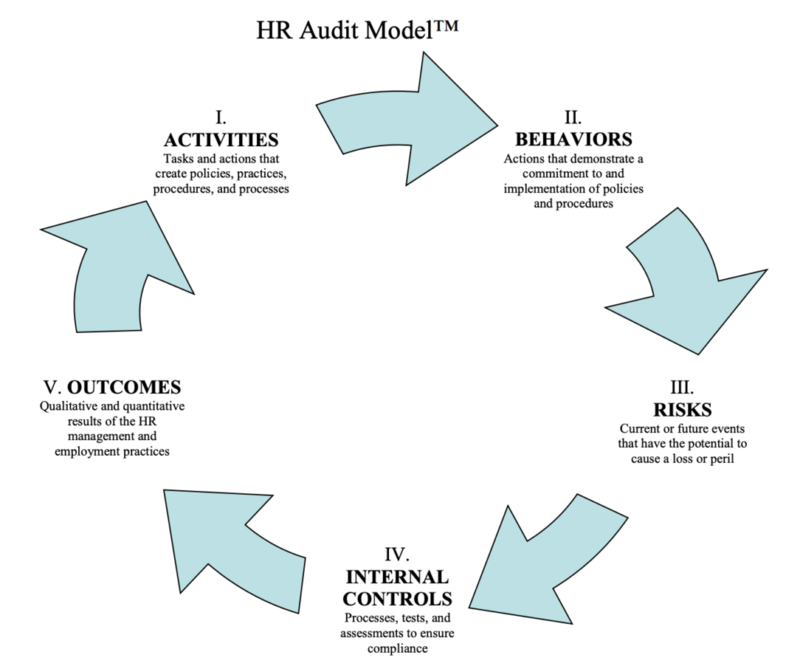 These five critical components, which should be addressed in every HR audit, are shown and discussed below in the HR Audit Model™. the organization’s activities, that is, the tasks and actions that create or implement employment policies, practices, procedures, and programs. Activities include such actions as the promulgation of an EEO policy statement, a sexual harassment policy, and other employment policies, and the posting of required employment posters. The Activities component of HR audits is typically evaluated by using a“checklist approach,” that is, the item is checked off when it is completed. 2) Behaviors: Behaviors in this context are actions and conduct that affect ─ either positively or negatively ─ the implementation or effectiveness of the organization’s policies, practices, procedures, and programs and demonstrate the organization’s commitment to stated goals and objectives. Examples of Behaviors include: the creation of a corporate culture that values and promotes equal employment opportunities, diversity, and compliance; the visible and unequivocal support by senior management for the organization’s diversity efforts; and the budgeting of sufficient resources to achieve EEO compliance and diversity goals. Behaviors are frequently assessed using qualitative measures, such as culture scan and employee satisfaction surveys. future events that have the potential to cause loss, peril, or vulnerabilities, and management’s willingness to accept those risks. Risk assessment is also the identification of events or conditions that create new opportunities for the organization to achieve its business objectives. Risk assessment provides management with the information to make an informed decision about the allocation of the organization’s human, physical, and financial capital and about effective ways to eliminate, mitigate, control, or transfer those risks. Human resource management and employment practices liability related risks include: employment law and regulation compliance failures; lost business opportunities due to the failure to attract, hire, and retain top talent; intangible asset losses due to turnover and the loss of top talent and key employees; ineffective staff development and succession planning; and lower profitability due to the inability to control labor costs. HR auditing activities include assessments of the external and internal factors that impact human resource management and employment practices, including: 1) the economy; 2) legal, regulatory, and litigation trends; and 3) demographic and structural changes in the workplace and work force. 4) Internal Controls: Internal controls are processes, tests, and assessments that help ensure compliance, manage risks, identify fraud, and help ensure the achievement of organizational goals. HR auditing activities include: 1) assessments of the effectiveness and efficiency of HR management processes, policies, practices, and procedures; 2) the reliability and accuracy of HR management reporting; and 3) the level of compliance with laws and regulations, industry and professional standards, codes of conduct and ethics, organizational policies, and budgets. 5) Outcomes: Outcomes are quantitative and qualitative measurements and metrics that measure and help assess the achievement of organizational goals and objectives. HR auditing activity includes the identification of metrics used by the organization to measure organizational and individual performance; the assessment of results by comparing actual results against projected results, budgets, and internal and external standards; and a description of the activities, behaviors, and internal controls that are needed to maintain or improve future results. improve their ability to achieve business objectives.